Nothing warms my heart more than coffee. Coffee and being able to help you guys save money. We all know Shipping costs can get a bit outrageous at times, so when they offer Free Shipping right before the long weekend (NA Side), it's just something I couldn't contain in. I had to shout this out for all our members to hear....FREE SHIPPING!!!!!! So now that my heart is warm, you the members of TAW can warm yourselves with your very own TAW clothing/items by going to our TAW Shop and making a purchase and get FREE SHIPPING!!!!! June 30th-July 2nd. Please use PROMO CODE: FS0717 when making your purchase. Once you've finished making your purchase, log onto TS (if you're not already on) and fill out the appropriate form on the TAW Shop Channel. I'll issue you a Swagster Tab for your purchase, once I can confirm it. Best of luck and to all those celebrating the long weekend, be safe. Ari is looking for some PIA Position Feedback! I'm currently looking into options on how we could improve things related to our amazing Public Information Administrators! The good news is that we have some interesting changes coming up on SOCOP's side which will be announced in near future - stay tuned! But I think that we can do better than that, and this is why I would need YOUR feedback so we can start taking these into consideration and plan around it, maybe even make them happen. So if you have anything you'd like to feed back to SOCOP, please fill out this form to help out and make TAW a better place. Because as we all know: we can't fix issues that we aren't aware of! You can contact me on Teamspeak or Arianni@taw.net if you need any assistance filling out this form, or have any questions regarding this or PIA stuff in general. It's about that time for another promotion from the Shop and what a deal do I have for you. Right now, all T-Shirts qualify for 15% off !!!!!!!!! This promotion is running June 15th - June 21st, so act fast because the window is a short period. This is a TAW Community Fund fundraiser to raise needed funds to support the TAW Community Fund and raise additional funds to support TAW’s ongoing activities. The goal of the “Give Five Campaign” is to have every member in TAW give $5.00+ or to donate for another member that may not be able. If this was to happen, we wouldn’t have to have another fundraiser for three years. Give Five? 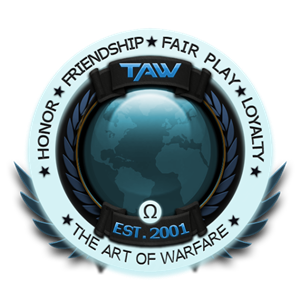 TAW, an ever expanding Gaming Community that is "for the members". Now we as members love to show that we're proud of our Gaming community by recruiting people to help our community grow, we post videos on Youtube, we Stream on Twitch, and we buy stuff from the TAW Shop. Our community is always Changing; we have new Divisions enter through Vanguard, leave Vanguard and find new homes in Corps, members come and go. Through it all, the TAW Shop also must change. Don't worry, we're not leaving. In fact, we're changing the Shop for the better! 1. 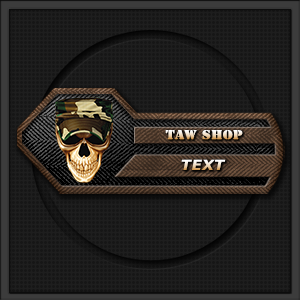 EVERY Item is Customizable: EVERY Item in the TAW Shop can be altered. We made a Wiki Post about, you can find it here. So now you can pick a product and adjust it to the way you want it (please remember that adding extra images/lettering will increase cost). So now on EVERY item, you can change the color of the image, add your callsign, even change what product it is itself to anything that Spreadshirt has to offer. All you have to do is select the item and then click the "Do you want to edit this design" and go to town. 2. Division Wear: A new category has surfaced in the TAW Shop, Division Wear. DC's and DO's are encouraged to fill out the form so the designs can be created. All text is in Stencil Format. Base colors used are those that represent your Division (Yes you can still edit them). You can find an example here for the Digital Combat SImulator's Design. 4. Suggestion Box: There is absolutely no way to know what TAW members want to see available in the Shop since I'm not a mind reader. But I am willing to listen, and that's why there is now a "Suggestion Box". A home for you, the members, to voice what you want to see. Not all requests are viable, but I'll see what I can do. 5. New TAB: Created a design that's being used in the TAW Shop?, there's a TAB for that. Made a purchase?, there's a TAB for that too. All you have to do is fill out the form and once confirmed, I'll issue you the TAB to go on your dossier. 6. TS Shop Channel: The TS Shop Channel has been changed to reflect some of the previously mentioned changes. Links to almost everything already mentioned are in the Shop Channel. Every time a new promotion starts/finishes, it will not only be added to the Shop Channel, but I will also make either a Blog or Forum post for the members to see. 7. Price Changes: Our supplier has recently done some changes to how prices affect products. Because of this, the Shop must adjust the prices to reflect the changes made. The changes made on our end is to try and help keep things at a relatively low cost to you, the member. This will be an ongoing process. 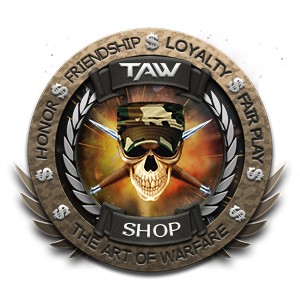 Important Information: Every time you make a purchase from the TAW Shop, a portion of the purchase comes back to TAW to help with the expenses of the gaming community. Donations or purchases from the TAW Shop, help cover important expenses such as our TS Server, Website, the funds that your Division gets to give as prizes and more. Everything always comes back to the members in one way or another. We're a community that is run by VOLUNTEER members, is for the members and THAT is one thing that will NEVER change. Should you have any Shop Related Questions, please contact me by sending me a message on my dossier. Ah, the month of June is now upon us and with it, warmer weather. But also, in just a couple weeks, the celebration of Father's Day. Where we celebrate that we are a father, or have/had a father. Following the line of Mother's Day, our amazing Team in the Graphics Division has created us some Proud Dad Logos for us in the Shop. So if you're a gamer dad or you have a dad who you think may like one of our shirts, swing on by to the TAW Shop and order your dad his shirt as a father's day gift. This is a perfect time, since Free Shipping is also available right now. That's right, FREE Shipping. Use code Code: FS617. Hello, and welcome to the TAW Shop. Another promotion has begun and it's an awesome one. Once again, we have FREE Shipping from June 2nd to the 4th. That's right, FREE Shipping. Use code Code: FS617. As always, please remember the following: If you purchase a Give 5 T-Shirt, please fill out the form so you can get Credit for donating to the Give 5 Program. This will also qualify you to receive a Give 5 TAB at the end of the fundraiser. Also, if you make any purchase from the TAW Shop, fill out the form to get a Swagster Tab. I check the Swagster Tab Form Sheet every couple of days and will issue the TAB once purchase has been verified. 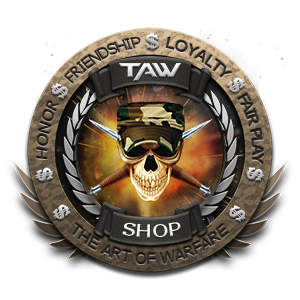 Finally, don't forget, you can customize your TAW Clothing Purchases by selecting the item and then clicking "Edit" below the item. Details on how to edit can be found here. Thank you in advance to those who make their purchases.